This item was sent to me the other day and was originally from a collector in an old Movie Maker magazine from years ago. People often talk about the light that floods out from the top of there projectors. I know many collectors have there own methods of blocking out this light and we all know we mustn't stop the heat from being blown out by the fan. At the end of the day they are there to do a job. Well, this item, also sent to me from Hugh Scott, was literally made from an old beer can, clearly one side is up so the heat is able to be blown out, Hugh also tells me that he also made his own from an old beer can and it works perfect. I myself simply use a post card folded in half and it fits into the groove of the handle, it still allows the heat out and as you can see, it's a dark colour card so absorbs the light and takes away all that flooded light onto the ceiling giving the image on screen a better contrast. It does make a huge difference as you see when you take it off during a show, especially night scenes. It looks good Tom ! A nice invention! And it works! Leon. Mines just the simple postcard Leon, the other from a collector in an old Movie Maker magazine, as you say, it does the job and cost is Zero. Its good to be inventive! Tom keep it up! 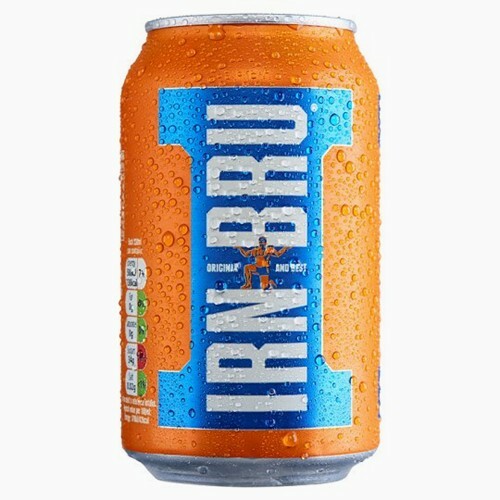 After all it has been, and always will be Scotlands national fizzy drink. Oh! I am presently shocked to read, that a certain Americam President who just happens to own a golf course in Scotland, has banned its sale at his fancy hotel. And quite frankly, I don't believe the story. If people want that drink, why not offer it? "The reason stated by Trump Turnberry general manager Ralph Porciani was because of IRN-BRU’s famous tendency to stain anything it touches. Having just undergone a reported $200 million refurbishment, keeping IRN-BRU off the premises is now a priority. Realize that as President, Trump doesn't (and cannot) get involved with the operations of any of his former businesses. It was the decision of Trump Turnberry's management, NOT Donald Trump. Back to Elmo lamp shades. Let's make this clear. Blocking the light spill from the lamphouse by any method, hand, piece of cardboard, beer can duct whatever, is going to have zero effect on the light intensity coming out of the lens. The picture may look brighter, but in fact it is not. You are simply reducing light scatter onto the screen from the lamphouse cover bouning off the ceiling and walls, so the picture looks much better with higher contrast, but is actually getting exactly the same amount of light onto the screen. A light baffle for the Elmo's is of course a great idea, as long as it does not significantly reduce air flow from the blower. I use a simple piece of cardboard tucked under the handle. I know it doesn't put extra light onto the screen though the lens, the point is to reduce the light scatter that does make the image look a little better in contrast, especially during dark scenes. Actually, one way to look at it is reducing the scatter puts less light on the screen. It's just now a bigger fraction of the light is picture (signal) and less of it is scattered light (noise). Same amount of coffee diluted in less water: richer flavor! It's why we lower the house lights in the first place. I'm pretty sure that what Tom means here is that the ST leaks an awful lot of light out of the top of that lamp house grill. So it can hit the ceiling and partly illuminate the room, thus reducing the overall darkness of the room and the perceived image contrast on screen. I know my ST blasts a LOT of light upward and a light coloured ceiling certainly helps fill the room with unwanted illumination. So preventing that light spillage whilst not preventing overheating of the lamp house simply helps keep the whole room a lot darker and thus the perceived screen image a bit brighter. No one for a minute would pretend that light can be contained and forced back through the lens...lol. "Actually, one way to look at it is reducing the scatter puts less light on the screen. It's just now a bigger fraction of the light is picture (signal) and less of it is scattered light (noise)." Ha! Yes, Steve, very good...it took me a couple of times to read that, but yes, absolutely right. Optics has always been a weak point for me, but if I can convert it to electrical terms I do better. I once tried to understand my wife in terms of amplifiers. Just to reiterate, The baffle has a slot at the top to allow air flow, the blower on the ST1200 is not very powerful, as the dichroic lamps don’t require the cooling that lamps do on older machines, the heat dissipates through the rear of the lamp, thus the blower is not as powerful as the older projectors needed for low light but much heat. I Know Hugh has used this little doohickey for 30 years or more to no ill effect, indeed, FAR safer than some people who wish to remove a very necessary component for film safety, the HEAT SHIELD, the baffle only reduces ambient light, ‘light scatter’ that reduces contrast, it DOES NOT INCREASE light output, much like watching a film in daylight, as opposed to night viewing, pretty obvious really. Tom, many years ago we had a flat which was fortunately large enough to have a separate small room as a cinema. But the white ceiling sloped down quite low toward the projectors at the back and as a result a LOT of light spilt upwards from the ST and bounced all over the room. I remember using on of those weights with an adjustable arm and a small crocodile clip (it was made for holding things you intended to solder!) which stood nicely on top of the back cover of the Elmo. Then a neat piece of black cardboard held in place above the lamp house allowed for plenty of heat to escape, but trapped any excess light. Funny how we've all found our own unique solutions to the same problems. Exactly Rob. Obviously if you have a huge room there will be less scatter, here in the UK we dont all live in mansions but those HDs do chuck out a huge amount of light. 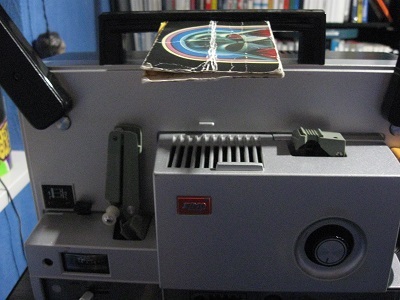 In fact my Eiki SL2 is a great design as very little light escapes from it due to a better desigh on its top vents. Purposeful and looks beautiful too, Paul. Thanks for your kind comment Rob. Yes, I do love these ceiling panels. In addition to looking good and blocking light reflection they also have some acoustic benefit in attenuating sound reflection off the ceiling. I think they are another example, along with screen masking, of getting a huge return on picture quality for very little expenditure.